Thursday December 1 at 8PM, screening of films by Carlos Motta (Col), Laure Prouvost (FR) & Roy Villevoye (NL), at St. Mary Majaks, 918 St. Mary Street. A correspondence between a Columbian and a Lebanese woman demonstrates how laws and religion determine the dominant discourse on sexuality. Lessons in representation and absurd storytelling, all washed down with an obligatory cup of tea. 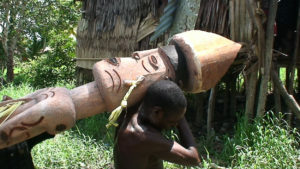 In the rainforest Papuans build a traditional sculpture for their deceased family member Omomá. In the meantime, the filmmaker has a business conflict elsewhere. *Descriptions by the International Film Festival Rotterdam.